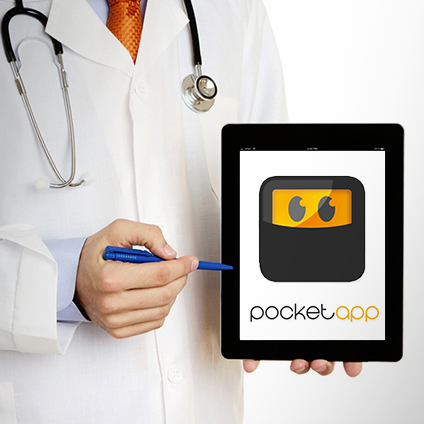 Pocket App goes all Medical! Over the past few months it seems that word has got round in the medical establishments up and down the country, as we’ve been getting approached by all sorts of men in white coats asking us to build them something! We’re currently putting the finishing touches to some iPad and Android tablet apps for the Royal College of Physicians in Edinburgh (RCPE). There’s been great positive feedback about the apps from an internal RCPE conference and the final versions will be released in January. We’re also working closely with an organisation called Med ePad. Med ePad works in partnership with senior clinicians up and down the country to develop content for Android tablet apps aimed at patients. Hospital patients are loaned the tablets, allowing them access to information about their condition 24/7 including videos and animations. It also acts as a communication tool allowing clinicians to set appointments and for patients to let the clinicians know how they are feeling. Other medical app based projects we are working on include apps aimed to assist doctors while on their daily ward rounds. Most excitingly, we’re currently in discussions with WHO (World Health Organisation), regarding apps which can be leveraged globally to provide important health information and advice. On another note, we recently visited the ‘Healthcare Efficiency Through Technology Expo’ at Olympia, as well as the ‘Institute of Digital Healthcare Conference’ up in Warwick University- giving us a fascinating insight in to the challenges facing healthcare and how technology can make a profound difference to people’s lives. Knowing that our work actively helps people, gives us a warm fuzzy feeling. Pocket App like warm fuzzy feelings.